How to Write HTML and CSS Faster:- I understand your frustration as a web developer. Every time you need to open up the tag and close the tag. It's irritating 😖. Every time open up head tag close the head tag, open up div tag and close the div tag. It's kind of a hard thing for a beginner or intermediate web developer. In this level, you might say "Hey, I don't need to learn syntax anymore." A very popular example is that when you need some example paragraph then every time needs to go Lorem Imsum website and copy the text and paste into your code. It's sometimes frustrating and time wasting. So, this article helps you to solve these problems and you easily Write HTML and CSS Faster. This situation is common for all. When people jump into learning web development maybe learn HTML and CSS and first time interact with HTML and CSS. The first time they need to learn these things in Hard way. Meaning that they need to type all the tags like HTML tags, head tags, body tags, div tags, etc. It's not bad to write all tags manually at first. It helps you to understand how actually tags behaved. But eventually, there will be a time, there will be a point that you can realize that "I don't need to write these tags, again and again, it's time-consuming". So, let's talk about the solution. The solution of these problems is Emmet. Emmet is not a new software or not new text editor to need switch on a new editor. It is a Plugin or Extension. Yes, don't worry it's a free plugin. It's just like chrome extension. It is easily available for your favorite text editor. You don't need to leave the favorite editor. 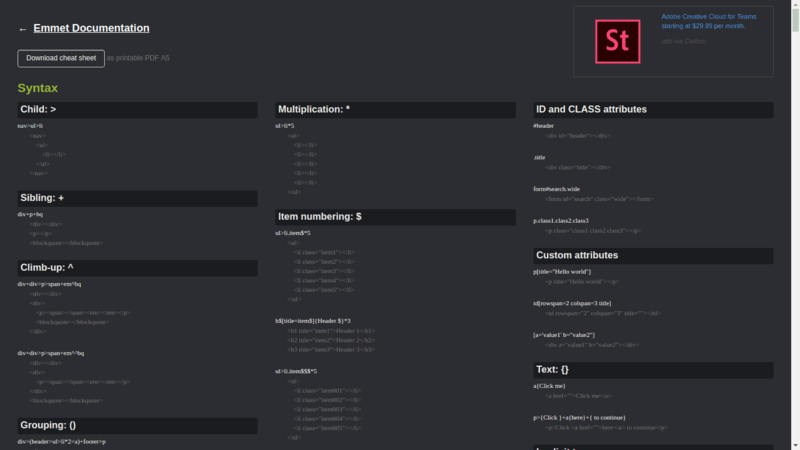 Emmet is available for most of the editor that are around like Sublime text, Atom, Bracket whatever your favorite editor, chances is the high this plugin is already available. You can easily download it and install it. All the instructions are available on the website. It's a super easy and remarkable plugin. I can enjoy it every single moment😌. And you are able to write HTML and CSS faster. What this plugin actually does? It is allowed to a lot's of shortcuts. Now in case, you might be remembered in some text editor there is a couple of shortcuts are available like autocomplete the code and more. This plugin is almost similar but a little bit advance. It gives you lots of variety list of shortcuts that you can learn a little bit on the go and use them in daily life. Maybe you do not need to course but if you are confused then join this. It helps you a lot. It's a very small course by Hitesh Choudhary. Emmet is just awesome. Once you get habit with then you can really enjoy that and it's hard to avoid that plugin. Be an open mind and try this plugin it's completely free 😁. and enter the Tab key then Emmet automatically writes 15 words for you. If you want more words then write other numbers like lorem20, lorem50 whatever you want. It's awesome 😄. More shortcuts are available in Emmet CheatSheet. Try this plugin and write HTML and CSS fast and comment your experience after using this plugin. While using this plugin you realize that your productivity will be increasing. Yes, your productivity will increase up to 30-40% after use this single plugin. I'll wait for your experience. And yes Don't forget to share this knowledge with your friend. Sharing is caring 😊. Nice Post! Previously I was Using Visual Studio Code From Microsoft and That was Very Easy To Use. After Reading This Post I switch To Emmet and Its Pretty Amazing. I really Love That editor, Thanks to you.